Bauer’s Bytes is searching for a new day! I’m looking at either Tuesday or Wednesday for the new posting. What do you think? A great prompt, and one I really enjoyed writing. 🙂 I hope you enjoy it as well! Sasha trudged up the last slope, heading for their bunker at the top of the ridge. Loose black dirt and lingering remnants of trampled, muddy snow squelched beneath his boots. Finally, winter was dissipating in the mountains. It was just freezing, most days. Living in the forest, deep in the Caucasus on the run from General Moroshkin, was not glamorous. It reminded Sasha of being back in training exercises from his Air Force days, when they were dropped in the Russian North with absolutely nothing and told to get back to base. Driving snow, ice storms, pounding rain. Bears and wolves. Sucking mud that was practically frozen coating his boots. The rub of hunger in his belly, an ache that wanted to be filled. And the stench. God, the stench. As bad as those days were, this was worse. Those exercises had an end. He could look forward to sleeping in his bed again, a warm shower, and a hot meal, if he only endured. What would be waiting for them all after this? Would there even be an ‘after’? How did a country put itself back together after two sides of the population tried their hardest to kill each other? History didn’t prophesy well. In the Caucasus, in the very mountains and the forest they were sheltering in, the endless, bloody Chechen wars had raged. There was no future to those wars, no happy ending, no settlement over a handshake and a brandy while people got on with their lives and learned to live in harmony. When Sergey was back in Moscow, back in the Kremlin—he refused to think that anything else was possible other than Sergey’s return to power—how would he deal with Moroshkin? With the nearly half of the military that had joined his coup? Or the others that had simply melted away, vanishing from their oaths and posts into nothing? The questions were too big for Sasha. He wasn’t a politician. He wasn’t in charge of a country, or was the man upon whose shoulders lay decisions that could shape the world, their nation, and millions and millions of lives. He could only do what he could do: fight. Fight, every single day, for Sergey. Give everything he had to Sergey. Breathing hard, Sasha frowned as he reached the flat, empty patch of dirt they used as a parking area outside the bunker. It was empty. Anton jerked his head to the side. “Down the back track. He did not say much when he left.” Smoke slipped from his lips with every word. Nodding, Sasha headed for the rear of the bunker. 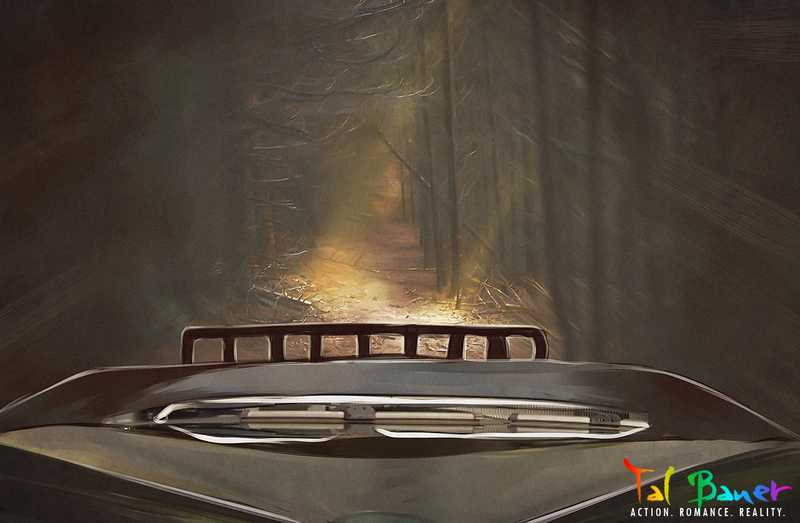 He found the jeep, the one he and Sergey shared, halfway down the rear track, just as Anton had said. It was parked in the middle of the dirt path, thick branches scrapping the sides and roof. The track was just large enough to drive through, if the scrapes and scratches of the branches on the windows and the metal frame didn’t shred your eardrums. Why had he just stopped? Was there something in the road? A fallen log, or a boulder dislodged from above, rolling into the track? Why was he just sitting there? Picking his way through the branches, Sasha tugged open the passenger’s door and climbed inside. Sergey sat in the driver’s seat, hands clenched around the steering wheel so hard his knuckles were white and the wheel was shaking, trembling in his grip. His jaw was tight, his muscles straining, and he sat ramrod straight, like he was struggling to hold himself that way. Half hovering over the passenger seat, Sasha’s jaw dropped. Guilt swept through him, flooding his body with heat. Of course. What had he been thinking? The news of Jack’s condition after the explosion at CIA headquarters had come through that morning. Jack was gone. Sergey’s friend was gone. “Sorry,” Sasha grunted. He backed away, all hands and feet and uncoordinated, stepping on the doorframe instead of opening it before his fingers fumbled with the latch. Freezing again, Sasha glanced at Sergey. Sergey had turned his way, staring at him with eyes that glimmered, red-rimmed and lost. Desperation leaked from his gaze, and something else. Anguish. Sasha’s heart lurched. He ached to go to Sergey, offer himself up to ease the hurt. Open his arms, and welcome Sergey into his hold. Kiss away the tears that threatened to fall, rub his hands down his back when he cried, stroke his shaking muscles. Sooth his pain, his grief. Remind him that he was not alone, no, he was never alone. He sat. Shut the door. Exhaled. “I am sorry,” he breathed. “Jack…” What could he say? He hadn’t known Jack like Sergey had. The connection Sergey and Jack had was strong enough to shake the world. They’d leaned into each other and built an alliance, a friendship, even. Made jokes in the press about the scandal of their closeness. Sergey had even risked the disgust of his nation to dance with Jack at his State Dinner. Friendships like that didn’t happen between world leaders, not anymore. A sniffle, and then a shaky breath. Sergey gripped the steering wheel again, kneading the worn leather, and groaned, his teeth clenched. He sniffed again, exhaled hard. Tried to level out his breathing. Every breath quivered. “Sergey…” Sasha laid his hand on Sergey’s trembling shoulder. What could he say? What could he do? His tongue sat heavy in his mouth, weighted down with uselessness. And then Sergey cracked, fracturing down the center of his being. Curling forward, the first sob came, physically wrenched from his chest. And then another, an anguished moan. Tears followed, flowing down his cheeks as he shook, as he screamed through clenched teeth and shook the steering wheel like it was the cause of his agony. Utter helplessness speared Sasha. Sergey’s pain was devastating, the grief of losing his friend and his country seeming to come out in one gut-tearing sob. It was awful, seeing a man come apart, consumed by soul-wracking pain. Another night came back to Sasha, from months ago. Another night of grief and mourning, and a soul-shattering emptiness that had made him want to claw his own bones out. Escape his very skeleton. Be anyone, anywhere, other than who he was. Not have to face what had come of his life. Sergey had held him through it. They were strangers then; he only knew of Sergey through the headlines and video clips he saw. Sergey knew of him only through his military record and Dr. Voronov’s retelling of his incident. But Sergey had cared for him, man to man, giving comfort freely when he saw Sasha’s aching emptiness. His hand snaked up, rising from Sergey’s shoulder to grip the back of his neck. Tugging, he turned Sergey toward him, gently pulling and prodding until Sergey faced him on the bench seat. Tears cascaded down Sergey’s cheeks, falling from his jaw like tiny diamonds. They splattered the leather between them, little splashes that Sasha swore he heard. Sergey wouldn’t look at him. He kept his gaze downcast, his eyes closed. Sasha wrapped both hands behind Sergey’s neck. “Look at me,” he whispered. Sergey sniffed. He didn’t look up. Slowly, Sergey’s eyes opened, and from beneath his lashes, Sergey’s eyes met Sasha’s. Pain. So much terrible pain. Anguish that stole Sasha’s breath away. Loneliness. Fear. Doubt. He moved his hands, cupping Sergey’s wet cheeks, and held his face in a gentle hold. As if he was going to kiss Sergey. “I am here with you,” he breathed. “Always.” You’re not alone. You’re never alone. Another sob wrenched free from Sergey, and he pitched forward, burying his face in Sasha’s chest. His tears fell into the scratchy wool of Sasha’s sweater, enough to soak through and dampen Sasha’s skin. Tentatively, he wrapped his arms around Sergey, around his bony shoulders and his thin back. A part of him rejoiced—he was holding Sergey, cradling him close. Could feel the warmth of his skin, his breath. It was almost like his dreams. Except not, because Sergey was sobbing, heartbroken, and lost, and devastation was the only thing they had to look forward to. He shouldn’t be happy about having Sergey in his arms, not when the price was this many tears. This kind of hurt. Sergey’s blond hair was mused and dirty—they were all dirty—but Sasha laid his cheek on top of Sergey’s head. His hands stroked over Sergey’s trembling back, mapping out his thin muscles. Counted the bones of his ribs, the knobs of his spine. Slowly, Sergey’s sobs subsided, quieting, until he was just sniffling against Sasha’s collarbone, one hand fisted in the loose fabric of Sasha’s jacket. “M’sorry,” Sergey mumbled. His hot breath ghosted over Sasha’s skin. Exhaling, Sergey lifted and dropped his fist against Sasha’s chest, once. Sasha held tight, not letting him go. His arms encircled Sergey, keeping him pressed against his chest. “Not yet. Sergey, not yet.” He held his breath and closed his eyes. Had he just given himself away? Was he taking advantage? Where did him wanting to comfort Sergey end and his shameful desire begin? He just didn’t want to let go yet. Not when Sergey’s back still trembled, and his eyes were still drenched and hollow. Looking down, he brushed one thumb over Sergey’s cheek, wiping away a tear that had slipped free from Sergey’s soaked eyelashes. He fought for something to say, his lips fumbling through half-broken words as he tried to explain away what he knew was in his eyes. Never, ever, he hissed in his mind. You swore! Nothing can ever happen. Never ever! Sasha’s terrible delight, and Sergey’s dark pain, all in one moment. A moment Sergey wished he could be rid of, wake from. Sasha’s lips twisted as he fought against himself, trying to hold back his own sudden grief. “Maybe,” he grunted. “You can try. Sleep, Sergey. Try to wake from this.” He kept his arms around Sergey, hoping his message was clear. Sergey could sleep in his arms, in his hold. Sergey didn’t move. Didn’t say a word. Finally, Sergey’s breathing leveled out. His jaw went slack and his head turned into a heavy, limp weight on Sasha’s shoulder. Since the coup, Sasha hadn’t seen him sleep more than a few hours at a time. Dark circles had grown beneath his eyes, paunchy bags that started growing their own bags. This was his chance. Sergey was asleep in his arms, resting finally in his care. He could press his lips to Sergey’s skin, drop a kiss to his hair. Whisper everything he wanted to confess to Sergey’s palm before placing a kiss in the center. He could say, finally, what had grown in his heart. Paint his love all over Sergey’s skin with confessions and declarations, promises he’d swear to the stars. Leaning back, Sasha tried to get comfortable. The doorframe dug into his back, the handle gouged his spine, and the glass was cold enough to chill his blood. He didn’t move though. Didn’t readjust. Didn’t do anything that could wake Sergey. As the hours crept on, Sasha stayed awake, stroking Sergey’s back as he held him close, sheltering him in his sleep. This was his terrible dream now: being, for a moment, the man who could love Sergey and could care for him. Be someone that could love him when his heart was broken. When Sergey woke, his dream would end. But, this moment, the closeness they shared. The comfort given and received. The warmth of skin on skin, and his promise to Sergey: I am here with you. For you. The memory of that, at least, would remain. Timestamp: Sasha and Sergey in the forest south of Sochi, in the Caucasus, post-coup and after reports of Jack’s “death” have hit the media. Enemies of the State – WINNER, Best Bisexual Fiction! So tender! I love this! I love that we see more of Sergey the man in this. Elsewhere, even when he’s relaxed with Jack or with his friend from his service days, he’s still not as…human, I guess, as he is here. It’s that vulnerability, that sense that underneath the tough, alpha male Russian exterior, he’s a man, just like any other…just like his friend Jack, who also needed a strong man to love him, to care for him, to have his back. I feel for Sasha, as I felt for Ethan. I can’t wait to see him get his HEA.